YouTube sensation Meredith Edwards harnessed the entrepreneurial opportunities of online video-blogging and created a career through her YouTube channel Southernbelle606. 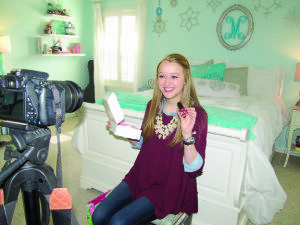 Edwards, a senior at Vestavia Hills High School, operates a fashion, beauty and lifestyle channel geared towards guiding young women and promoting self-confidence. Edwards said she finds her own inspiration in celebrities like Taylor Swift and Selena Gomez but also in seasoned YouTube stars and Alabama’s own Eleventh Gorgeous. Though Edwards has established her Southernbelle606 brand, she said she plans on expanding her business in the future. When she heads off to college in the fall, she plans on studying social entrepreneurship at Belmont University in Nashville. “It sounds like it would have something to do with social media, but it doesn’t,” said Edwards, who attended a class that explained the major. Social entrepreneurship is akin to learning how to run a nonprofit organization such as the Tom’s shoe company and the popular thrift store Goodwill. Edwards said she believes the major will help teach her how to turn her personal brand into a thriving business. With or without schooling, Edwards is already profiting from Southernbelle606. She has partnered with a company called Style Haul that places ads before her videos and pays her a certain amount of money for every 1,000 views her video receives. And it’s not only money that she makes; being a member of Style Haul provides a lot of advantages, she said. Edwards said she also receives free products from online companies. In return, she tests the items and features them on her show. She receives so many packages a week that she has created a “Mail with Mere” segment on her show where she unboxes the products she receives during the week. Over time she has picked out a few favorites. While Edwards enjoys the perks of her job, her favorite thing about Southernbelle606 is not a material object. Edward’s personal style has led her to Internet fame with more than 40,000 subscribers and over 1.6 million viewers from around the world tuning in to watch and learn. Edwards’ mother said she’s proud of her daughter. As the seasons change, Edwards said she is looking forward to lots of color this spring. “My favorite colors are any kind of pastels,” she said, adding that her favorite designer is Lilly Pulitzer, known for vibrant printed patterns. Edwards also loves to accessorize her outfits with statement necklaces, she said while wearing a large gold necklace featuring a cluster of pearls in various sizes. “I also like dainty jewelry. I have a necklace from Kendra Scott right now that I really like,” she said. As for hair, Edwards said she tends to wear her hair down most of the time and is always searching for the quickest way to achieve the perfect curl. In her free time, when she isn’t posting a video or working her retail job, Edwards said she loves to shop and considers herself a bargain hunter. Edwards’ biggest plan for the future is her move to Nashville for college, but she said she has a few plans before she leaves. “I’m planning on doing a meet and greet sometime this summer before I leave for college,” she said. She met a few of her fans in Atlanta last year and said she hopes to do something similar here in Birmingham. “It won’t be anything formal, just sitting down and meeting new friends,” she said. For more about Meredith Edwards, visit www.youtube.com/user/southernbelle606.